Welcome to Cupcake Tuesday! I’m so glad to have you! I have updated the Cupcake Heaven page, there are over 150 designs and recipes! 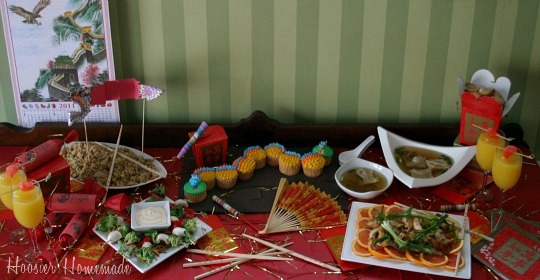 Over the weekend, Doug and I put together a fun Chinese New Year Celebration for you. Most of the week, we will be sharing the recipes, decorating and crafts we made. We also have a giveaway on Thursday, so stay tuned for that! 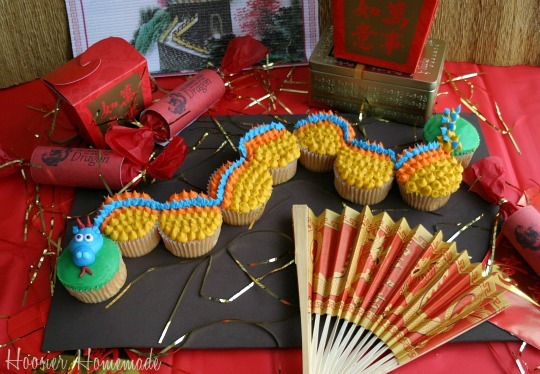 These Dragon Cupcakes were the perfect addition to the Chinese New Year Celebration. 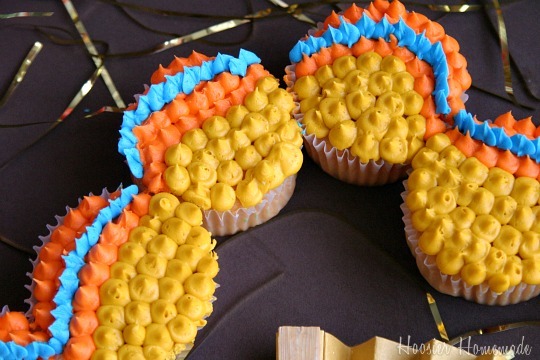 They would also be great for a dragon lovin’ kiddo’s birthday party. 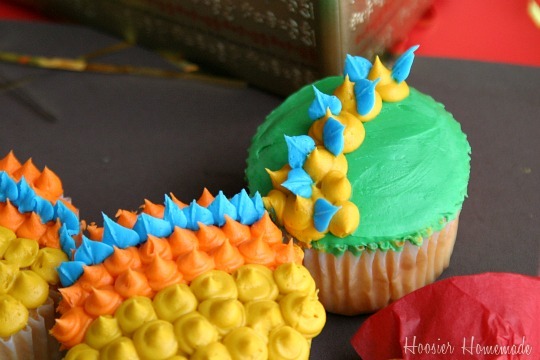 I used bright colors, but you could certainly change the colors to fit the birthday theme. 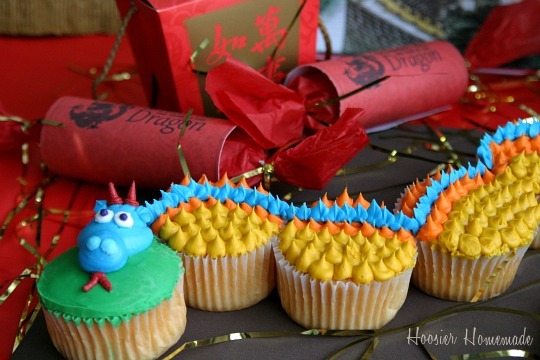 Make these fun Dragon Cupcakes from HoosierHomemade.com to celebrate the Chinese New Year! We kicked off the Chinese New Year Celebration with Orange Mango Chicken yesterday. It has amazing flavor, and is a quick and easy meal for anytime, not just for the Chinese New Year. Can you send me the info on how to make the Stilletto heels…..I can’t seem to get to that page….. I found this photo via your Flickr photos….I LOVE IT SO MUCH….it is super cute and so original!!! Awesome job!!! Btw LOVE the stiletto cupcakes as well! That dragon is just too cute for words! We will be having our Chinese New Year celebration on Monday! That dragon is just the coolest! Love it! I would also love if you would stop by and share it tomorrow at Mrs Foxs Sweet Party! 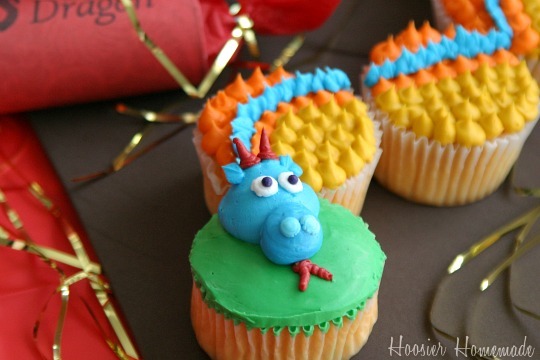 Happy Cupcake Tuesday! love the dragon! great job L!